BorderWare and LignUp, respective leaders in IP security and converged communications solutions, announce the integration of BorderWare's SIPassure VoIP Security Gateway into the LignUp Communications Application Server. Powered by BorderWare, LignUp's server provides enterprises and service providers with a single source for cost effectively building and deploying secure VoIP-enabled applications across any network. The integrated product is available today from LignUp. It can be implemented by enterprises and service providers as an on-premise or hosted solution. Under the agreement, LignUp is embedding BorderWare's application-layer security into its Session Initiation Protocol (SIP) based software. The LignUp Communications Applications Server and LignUp Communications Web services provide all the functionality developers need to voice-enable Web applications, portals and processes. The combination of LignUp software and BorderWare's SIPassure enables secure deployment by protecting against SPIT (Spam over Internet Telephony), Denial of Service (DoS), unauthorized registration and other types of VoIP attacks that would easily penetrate packet-layer security devices. Because BorderWare is network-agnostic, companies can extend the benefits of secure, VoIP-enabled business processes to remote workers, supply chain partners and other authorized users, regardless of how they connect into an intranet or secure website. 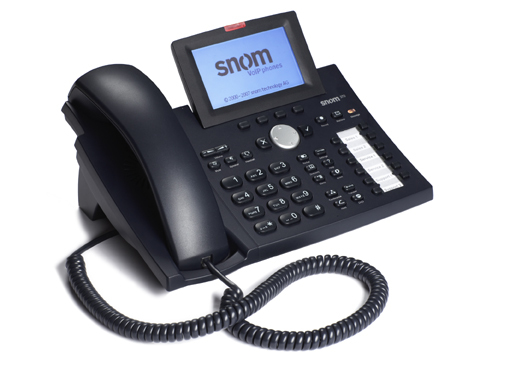 snom announced the latest addition to its line of IP business phones, the snom 370. The snom 370 will provide users with the flexibility and features needed to maximize productivity and efficiency in a business environment. Larger display, expanded memory and VPN access offer business users a simple and secure way to manage calls. Vocalscape Networks announced that their turnkey VoIP system now includes provisions for providing VoIP service using a prepaid ATA model. The new model allows service providers to deliver prepaid Voice over IP (VoIP) telephone service to users who are using traditional phones with an analog telephone adapter (ATA) or softphone. "Vocalscape's prepaid ATA model gives service providers more flexibility in their offerings," commented Ron McIntyre, President of Vocalscape. "The ability to mix prepaid, postpaid and subscription services means, for example, that customers who are on basic subscription plans can make long distance calls outside their plan using prepaid funds instead of being billed later. This allows end-users to meter their spending and significantly reduces risk for the service provider as calls outside the plan are paid in advance." Continuing its trend of giving customers fabulous offers, MediaRing Limited, the leading VoIP telephony service provider in Asia, is adding another spectacular promotion for the upcoming Lunar New Year. MediaRing is offering free calls to five key destinations -- Singapore, USA, Canada, China and the United Kingdom -- when you sign-up for its soft-phone based VoIP service at http://www.mediaringtalk.com. Sign-up is absolutely free! The Logitech Cordless Internet Handset brings the familiarity and ease-of-use of a premium cordless phone to free Skype calls. Stay close to friends and family, not your computer — the phone works at a distance of up to 164 feet (50 meters) away from your PC, while the color LCD displays available Skype contacts, Skype Voicemail notifications, caller ID, call waiting, and call history information. Premium appearance, selectable ring tones, and convenience features such as an illuminated dial pad, hands-free speakerphone, belt clip and headset jack make the phone a pleasure to use. Check voicemails and call your contacts - all from the handset. Place the phone and cradle where it is most convenient—only the USB base station connects to the PC. It seems everyone is talking about the Apple iPhone these days. Conan O'Brian even did a spoof of the iPhone with his iPhone commercial. He goes on to show us the many uses of the iPhone including a camera, movie player, tv remote, to a bottle opener proving the iPhones got it all! "The iPhone, it's everything!" Including a hard to use cell phone. So sit back and enjoy the clip. In recognition of professionals who respond to emergencies and help keep communities safe, AT&T Inc. announced $1 million in contributions to public safety organizations. AT&T provided $750,000 to the Public Safety Foundation of America, Inc. to help first-responders locate more 9-1-1 callers in times of emergency. Additionally, a $250,000 contribution to the National Fraternal Order of Police Foundation recognizes the contributions of law enforcement officers and supports the families of officers killed in the line of duty. "We remain very grateful to the dedicated professionals who work every day to keep our communities safe -- especially law enforcement officers, firefighters and other first-responders," said Jim Cicconi, AT&T senior executive vice president-External and Legislative Affairs. "We are proud to play a part in helping these professionals and extending our commitment to public safety to include the beneficial programs administered by the Public Safety Foundation of America and the National Fraternal Order of Police Foundation." While increased use of instant messaging (IM) in the enterprise, along with the proliferation of features such as file sharing and whiteboarding, make voice over IM (VOIM) an attractive option for converged communications, VOIM service providers must tackle ease-of-use and interoperability issues before the technology will become more widespread, according to the latest report published by Light Reading's Enterprise VOIP Insider, a paid research service of CMP Technology's Light Reading. "Voice Over IM: The Next VOIP Disrupter" examines the VOIM market from the viewpoint of IM service providers, including those that currently provide VOIM services, as well as those that are developing such services for the future. It looks at the issues VOIM service providers must address for the market to succeed, including targeting a customer base, developing a recurring revenue stream, and determining the best ways to drive customer usage. The report also examines features that make VOIM a viable application, possible barriers to usage, and factors that differentiate VOIM service providers. TechnoConcepts announces that its subsidiary in China, Jinshilin Techno has received from the Shanghai Forest Electronics Technology a product supply and sales contract for 100,000 set-top boxes integrating both Internet Protocol Television (IPTV) and Voice Over IP (VOIP) phone services. The contract represents the first such purchase order pursuant to the Cooperation Agreements between Jinshilin Techno and Shanghai Forest, under which Jinshilin Techno expects to ship a total of two million IPTV/VOIP set top boxes to Shanghai Forest by the end of 2009. Shanghai Forest has agreed to pay in excess of $9 million for the 100,000 boxes, with 30% of the price of each shipment to be paid in advance. The first shipment is for 5,000 units in February 2007, ramping up each month to a shipment of 30,000 units in July 2007.
babyTEL is expanding into the United States market; offering retail customers freedom from both expensive traditional phone lines and big VoIP players with their service challenges. "We're nimble. We're customer focused. And we have a proven technology that our loyal Canadian customers love," says Stephen Dorsey, babyTEL President and MIT engineering graduate. "Now we're open for business in the U.S. supplying Americans with no hassle VoIP service, U.S. phone numbers and responsive tech support, something the so-called giants have trouble delivering. We know the key to success is serving, not alienating, the customer." Beyond the boring "lowest price" mantra in the industry, babyTEL is about innovation and supplying customers with true VoIP benefits that traditional phone lines can't deliver and big VoIP companies don't deliver.